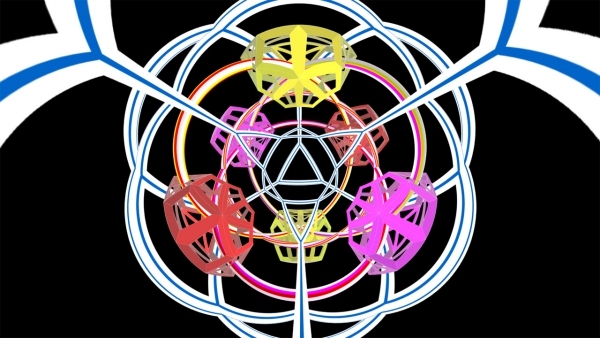 Tom Banchoff: Since 1968 as a mathematician specializing on visualization of geometric phenomena in higher dimensions, I have collaborated with computer scientists to produce animated films , specifically "The Hypercube: Projections and Slicing" and "The Flat Torus in the 3-Sphere" together with Charles Strauss. In a paper published in 1983 I investigated central slices of the 5-cube, including a 4-cell with 3-sphere boundary consisting of ten truncated tetrahedra as in this new film. Charles Gunn: My mathematical films present a view of mathematics complementary to that found in academic mathematics and schoolbooks. I'm interested more in the intuitive ground of mathematics where creative mathematicians move and work, than the logical formulations that they compose upon their return in order to describe their discoveries to colleagues and the world. These formulations provide the technical basis of the movie but are not to be confused with the content. The 10-cell is a regular tessellation of the three-dimensional sphere by 10 identical truncated tetrahedra (TT). Its rich and complex symmetry is portrayed in this short film. Each TT is paired with its polar partner in the same color. The movie begins by showing how six of the 10 fundamental regions can be generated by a screw motion around one line (which appears as a fixed circular tube with a 3-color stripe). This motion is repeated with a boundary framework, and then using full size for the fundamental regions. Then we fly along the polar line (which goes perpendicular into the screen). Straight lines appear as circles since the movie is rendering using conformal curvilinear perspective (see C. Gunn, "Rendering the Whole World ...", Bridges 2013). The movie is without narration, but with special musical score composed by Luis Vera.